Thank You for Attending SNL 2017 Baltimore--On to Québec City, Canada! Thank you to all of the presenters and attendees who joined us in Baltimore. It was a fantastic meeting, featuring a great scientific program mixed with some fun social events. In addition to a stellar lineup of keynotes, talks, symposium, and posters, the meeting debuted five fast-paced poster slam sessions, the latest addition to the SNL scientific program. Now, we are looking forward to the 2018 meeting, which will be held in beautiful Québec City, Canada. 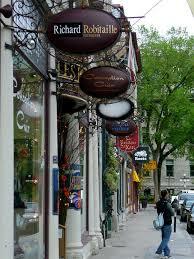 Québec City is the perfect combination of a modern, sophisticated city combined with old-world charm. 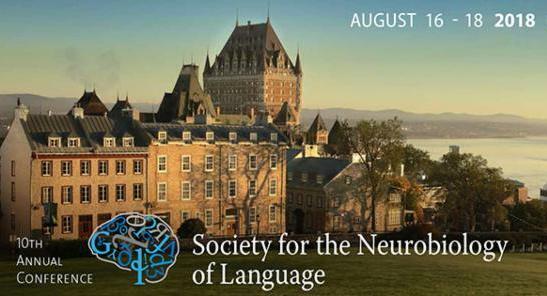 Please reserve August 16 - 18, 2018 and join SNL in Québec City. Tomorrow you will be receiving the SNL 2017 Survey. The Survey is aimed at improving the Society and future meetings and will affect many important Society decisions moving forward. We value the membership's feedback and hope that everyone will participate in the survey! Thank You for Attending SNL 2017! Applications are invited for a 4-year full-time PhD Studentship at the Basque Center on Brain Cognition and Language (BCBL) in San Sebastian (Spain) within the research group of "Parkinson's Disease and Neurodegeneration". The specific aim of group focuses on understanding the neurophysiological mechanisms underlying the start and progression of neurodegenerative diseases, particularly in Parkinson's disease (PD), with a multimodal approach including magnetic resonance imaging (MRI) and spectroscopy, electrophysiology, genetics and behavioural studies, with the final goal of better non-invasive diagnosis and treatment in clinical practice. The group is performing several cross-sectional and longitudinal studies in PD patients with mild cognitive impairment (MCI), dementia and impulse control disorder (ICD). These studies collect an extensive MR protocol in PD patients and matched controls, including high resolution structural T1- weighted and T2-weighted MRI, diffusion-weighted MRI, resting state and task-based functional MRI. The candidate will pursue a research project that will delve into this comprehensive dataset to discover early biomarkers for cognitive decline and dementia in PD patients, as well as to investigate the pathophysiological mechanisms associated with the cognitive decline and the development of impulse control disorders (ICD). Through the project the candidate will investigate state-of-the-art machine learning techniques, as well as complex networks and graph theoretical analyses that effectively integrate information from multiple heterogeneous multimodal MRI data sources. The group has easy access to a 3T Siemens PrismaFit MR scanner to test novel hypotheses in new subjects. Due to the multidisciplinary nature of the research project, the ideal candidate should have a Masters degree, or equivalent experience, in Engineering, Physics, Mathematics, Signal Processing, Computer Science or another other relevant area. Candidates with a background in Medicine (neurology), Neuropsychology and Cognitive Neuroscience who have an interest in advanced data analyses are also encouraged to apply. Strong programming skills in Matlab, R or Python, as well as experience in the analysis of neuroimaging data are a plus. A good command of English is required, and knowledge of Spanish is an advantage in the daily basis and training is given at the BCBL. The BCBL hosts cutting-edge neuroimaging facilities that are fully available for research purposes and will be routinely used in the project (www.bcbl.eu). Candidatures will be considered until the position is filled, but all applications received prior to 31st December 2017 will be considered for the position. The Brain Organization for Language and Literacy Development (BOLD) Lab at the University of Delaware, Department of Linguistics and Cognitive Science, is seeking graduate students with interests in language, literacy, and cognitive development. The BOLD Lab uses MRI and functional Near Infrared Spectroscopy (fNIRS) neuroimaging technology in combination with genetic and behavioral analyses, including field neuroimaging in rural sub-Saharan Africa. Research focuses on children's development including language (bilingualism, signed languages), reading, and cognition. A postdoctoral position is available in the Language Neuroscience Laboratory (PI: Stephen M. Wilson, Ph.D.) at Vanderbilt University Medical Center in Nashville, Tennessee. The successful applicant will play a key role on NIH-funded research projects investigating the functional reorganization of language processing in individuals with post-stroke aphasia. A Ph.D. is required in a relevant field, such as Psychology, Cognitive Neuroscience, or Speech, Language, and Hearing Sciences. The ideal candidate will have experience in conducting neuroimaging studies related to speech or language. A record of research productivity is highly desirable. Programming skills are also desirable. Research in the Language Neuroscience Laboratory is focused on investigating the neural basis of language function, understanding how language breaks down in patients with different kinds of aphasia, and identifying patterns of neuroplasticity that can support recovery over time. Our approach combines multimodal neuroimaging with quantitative assessments of language function. Our work is supported by the National Institute on Deafness and Other Communication Disorders (NIDCD). Vanderbilt University provides an excellent environment for our research program. The Vanderbilt University Institute of Imaging Science (director: John Gore, Ph.D.) is a state-of-the-art facility with two 3T scanners and one 7T scanner, and there are numerous investigators at Vanderbilt carrying out innovative cognitive neuroscience research. The Department of Hearing and Speech Sciences offers top-ranked graduate education in Speech-Language Pathology and Audiology, and provides clinical care to thousands of individuals with communication disorders. We work closely with colleagues at the Vanderbilt Stroke Center (director: Howard Kirshner, M.D. ), which sees over a thousand patients each year, and the Pi Beta Phi Rehabilitation Institute (director: Michael de Riesthal, CCC-SLP, Ph.D.). The successful candidate will have opportunities to collaborate with an outstanding group of scientists and clinicians, and to build an independent research program. Nashville is often rated one of the best places to live and work in the USA, thanks to its vibrant economy, reasonable cost of living, educational opportunities, friendliness, diversity, and renowned live music scene. Salary will be commensurate with experience, and will be consistent with NIH NRSA stipends. The start date is flexible, and the position is open until filled. To apply, please send a letter of interest, a CV, up to three representative publications, and contact information for two references, to Stephen M. Wilson <stephen.m.wilson@vanderbilt.edu>. The BLIP Lab and the LEAP Lab at NTU in Singapore are hiring! Together we have positions for 2 PhDs, 2 Postdoctoral Research Fellows, 2 Research Associates and 4 Project Officers (Research Assistants). Each of the roles has a different specialization, so join us while we grow our team! BLIP Lab and LEAP Lab are launching an ambition 5-year-long research programme: "How language mixes contribute to effective bilingualism and biliteracy in Singapore". With four official languages, the linguistic environment of Singapore is globally unique, with rich, inter-generational bilingualism in diverse languages, with diverse writing systems. This landscape provides unique advantages for Singapore's progress in an increasingly globalised world. It also presents unique challenges in education, as teaching practices established in monolingual communities (like the US, the UK and Australia) may be poorly suited to the needs of Singapore's bilingual learners. This research will evaluate how different patterns of exposure influence bilingual and biliterate language development in three research streams. We will record language spoken around infants and toddlers in the home, and evaluate patterns of language used in the homes of Singaporean caregivers from birth to 2 years; We will investigate how different language mixes contribute to the sensitivity, flexibility, and speed of toddlers' aural-language skills; and we will investigate the link between early language skills and learning to read, in a group of children evaluated for their early aural and pre-reading skills pre-kindergarten, and their reading and brain network connectivity after school entry. The research positions advertised here relate to the Infancy research stream and a battery of tests of aural language skills for use with infants, toddlers and pre-readers. The University of Connecticut invites applications for a full-time, tenure track/tenured faculty position and Scientific Director of the Brain Imaging Research Center (BIRC). The salary and academic rank will be commensurate with qualifications and experience. Responsibilities will include intellectual leadership and financial management of the Brain Imaging Research Center and active participation in cognitive neuroscience research. The candidate's academic appointment will be in Psychological Sciences, Speech, Hearing, and Language Sciences, or Education, and will include teaching at the undergraduate and graduate levels. The Scientific Director should be able to demonstrate leadership and collaboration across disciplines, and have a track record of grant-funded research. The Director should be able to articulate a vision statement and a strategic plan for the BIRC to be an intellectual hub, and will be instrumental in building an interdisciplinary MRI research program. Specifically, the Director will be responsible for the continued development of a nationally prominent collaborative research effort by: 1) promoting funded research in human neuroscience and related fields; 2) the administration of imaging services to the UConn cognitive neuroscience community; 3) broadening the base of BIRC users by mentoring new users, organizing classes, workshops, and symposia on imaging methodology and advanced techniques, establishing partnerships with local and regional organizations, and ensuring that scientists have access to the technical and scientific expertise needed to advance their research; 4); recruiting outstanding investigators and 5) working with the UConn Foundation. University of Connecticut has dynamic, highly-regarded research programs in cognition and cognitive neuroscience, language, speech, and reading, developmental psychopathology, health psychology, kinesiology, genetics/genome sciences, and others, including the Institutes for the Brain and Cognitive Sciences (IBaCS) and for Collaboration on Health, Intervention, and Policy (InCHIP). UConn's ambitious program of growth in cognitive neuroscience is housed at a 3,200 square foot, research-dedicated neuroimaging center with a Siemens Prisma 3-Tesla scanner, with facilities for simultaneous and standalone EEG, TMS and tDCS. To Apply: Interested applicants must apply electronically (hr.uconn.edu/jobs/) by submitting the following documents as a single PDF file: cover letter; curriculum vitae; teaching statement (teaching philosophy, teaching experience, commitment to effective learning, concepts for new course development, etc. ); research and scholarship statement (innovative concepts that will form the basis of academic career, experience in proposal development, mentorship of graduate students, etc. ); commitment to diversity statement (broadening participation, integrating multicultural experiences in instruction and research, etc. ); and names of three references. For additional information, contact: Inge-Marie Eigsti, Chair of Search # 2018194; Psychological Sciences, U-1020, University of Connecticut; 406 Babbidge Road; Storrs, CT 06269-1020; inge-marie.eigsti@uconn.edu. Evaluation of applicants will begin November 15.For more information regarding the BIRC, please visit our website at www.birc.uconn.edu. The Arnold School of Public Health at the University of South Carolina is inviting applications for a 9-month tenure-track position at the rank of Assistant Professor, to begin in August 2018. Qualified applicants must have a strong background in biostatistics and/or neuroimaging data analysis, a PhD in a related field, as well as a research agenda commensurate with the aims of the department, school and institution. Other qualifications include: (a) strong potential for excellence in research and teaching; (b) publication record in peer-reviewed journals; and (c) desire to work in a progressive research-friendly environment. Postdoctoral experience in research and success in obtaining competitive grants is preferred, as is experience conducting research in a clinical setting. The successful candidate will hold a tenure-track appointment at the assistant professor level in the Department of Communication Sciences and Disorders or the Department of Epidemiology and Biostatistics, depending on research focus. They will collaborate with researchers in the Center for the Study of Aphasia Recovery (C-STAR; https://cstar.sc.edu/), conduct and disseminate independent, internationally recognized research, participate in the solicitation of external grant funding, teach at the Master's and doctoral levels, mentor PhD students, and participate in professional, university, and community service. Teaching load is commensurate with research effort but typically does not exceed two courses per year. The University of South Carolina is a Carnegie University of High Research Activity and of Community Engagement. Located in the capital city of Columbia, the Arnold School of Public Health is a campus leader in interdisciplinary scholarship with ongoing collaborations with colleges, centers, and schools at the University. More information can be found at www.sph.sc.edu. The Department of Communication Sciences and Disorders is fully accredited by the Council on Academic Accreditation in Audiology and Speech-Language Pathology (CAA) and offers Master of Speech Pathology (MSP), Master of Communication Disorders in Speech-Language Pathology (MCD), and PhD degrees. The Department of Epidemiology and Biostatistics offers Master of Public Health in Biostatistics (MPH), Master of Science in Public Health in Biostatistics (MSPH), Ph.D. degrees in Biostatistics. The Neuroplasticity & Development Lab at Johns Hopkins University invites applications for a 2-3 year NIH funded post-doctoral research position (PI: Dr. Marina Bedny). The Neuroplasticity & Development lab investigates how experience shapes human cognition and brain function using functional magnetic resonance imaging (fMRI), transcranial magnetic stimulation (TMS) and behavioral measures. We compare the minds and brains of populations with different development experiences e.g. congenitally blind, late blind and sighted individuals. A key research direction in the lab investigates the reorganization of visual cortex in blindness as a window into understanding the functional flexibility of human cortex. We also investigate the influence of sensory and non-sensory experience on the organization of conceptual systems and experience-based plasticity in higher-cognitive systems. The post-doctoral fellow will have an opportunity to develop her/his own research program within the themes of the laboratory: plasticity and development of higher-cognitive systems. Fellows will be encouraged to take part in the intellectually rich cognitive science and neuroscience community of Johns Hopkins University. A Ph.D. in Cognitive Neuroscience, Experimental Psychology or related field is required. Qualified applicants will have a strong interest in cognitive neuroscience, development and neuroplasticity and higher-order cognition. Expertise in fMRI is preferred but candidates with proficiency in other relevant domains/techniques will also be considered (e.g. psycholinguistics, TMS/EEG/DTI). Interested candidates should submit a letter of interest, a CV and contact information for three references by emailing the lab director at marina.bedny@jhu.edu. Additionally, please upload the above application materials to Interfolio https://account.interfolio.com/login. Applications will be evaluated on an ongoing basis until the position is filled. The starting date is flexible and available candidates could begin work immediately. However, we would like to fill the position no later than September 2018. The Schnur laboratory at the Baylor College of Medicine invites applications for a postdoctoral fellowship as part of the NIH project "Language and Neural Recovery from Stroke". Our laboratory enrolls participants in the acute phase of stroke for behavioral testing and neuroimaging from the three Houston Texas Medical Center's comprehensive stroke centers. The goal of the project is to understand the neural and cognitive systems which contribute to recovery of language in the year following stroke. We enjoy collaborations with research groups in Houston, as well as nationally and internationally. Our laboratory is within a 10-minute walk of patient recruitment sites and 1-minute from our Center for Advanced Magnetic Resonance Imaging (CAMRI; https://www.bcm.edu/research/centers/advanced-mr-imaging). At CAMRI, we collect quantitative and functional neuroimaging from patients and neurotypical controls on the 3T Siemens Prisma scanner. Required: The successful candidate should have a PhD in a field related to cognitive neuroscience. Strong expertise in human fMRI and/or quantitative neuroimaging data analysis as evidenced by the Ph.D. thesis and/or publications is required. Desirable additional qualifications include experience in psycholinguistics, cognitive psychology, and/or cognitive neuropsychology. Informal enquiries can be made to Tatiana Schnur (tschnur@bcm.edu). Please apply directly to vacancy #290007DP at www.bcm.edu/careers. In addition, please email the below materials to schnurlab@gmail.com with the subject line: BCM postdoctoral fellowship. Ideally, candidates will begin in Winter 2018. Baylor College of Medicine is an Equal Opportunity / Affirmative Action / Equal Access Employer. The International Max Planck Research School (IMPRS) for Language Sciences is once again recruiting three candidates for its coveted IMPRS Fellowships. The Fellowships are intended to encourage interdisciplinary language research that takes advantage of the high concentration of top-rated expertise and facilities available in Nijmegen, Netherlands. Each PhD position is funded for four years with a preferred start date of September 1, 2018. The IMPRS is the leading research school in the world devoted to studying the foundations of human language. It is a joint initiative of the Max Planck Institute for Psycholinguistics and its partner institutes at the Radboud University: the Donders Institute for Brain, Cognition and Behaviour, and the Centre for Language Studies. The research school offers unrivalled training, top facilities ranging from genetics labs, advanced brain imaging techniques to a virtual reality lab, and an outstanding interdisciplinary environment. The application deadline is January 2, 2018 (midnight CET). The Fourth Learning and Plasticity Meeting in Äkäslompolo, Finland is a cross-disciplinary meeting that connects psychological and neuroscience research on the mechanisms of learning and brain plasticity. Lars Nyberg, Umeå University, Sweden.